Dujiangyan Irrigation System is an ancient technological wonder of China. More than 2,000 years ago, Li Bing (c.250-200 BC) served as a local governor of Shu State. At that time, the Mingjiang River flowed fast down from mountains. As it ran across the Chengdu Plain, it frequently flooded the Chengdu agricultural area, and local farmers suffered much from the water disaster. Li Bing and his son designed this water control system and organized thousands of local people to construct the project. The headwork is a large hydraulic water project. It consists of three main parts: the Fish Mouth Water-Dividing Dam, the Flying Sand Fence and the Bottle-Neck Channel. When the construction was completed, the dam system automatically diverted the Minjiang River and channeled it into irrigation canals. Gradually, the Chengdu Plain turned into one of the most fertile places in China. Since 1949, expansion has been undertaken, and at present, the system works very effectively. It irrigates farming land across 33 counties in West Sichuan Province. 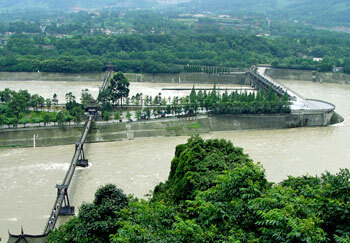 The system benefits local people, and the people are proud of the Dujiangyan Irrigation system. On the 29th of November 2000, Dujiangyan Irrigation System and Mt. Qingcheng were placed on the World Cultural Heritage list. Dujiangyan Irrigation system in Sichuan province. Erwang (Two King's) Temple was built to commemorate Li Bing and his son. “Erwang” means “two kings”. Originally, the temple was called Wangdi Temple ( 望帝祠) in memory of Duyu (杜宇) , the king of the ancient Shu. Later Wangdi Temple was relocated in Pixian county during the Southern and Northern Dynasties. So local people renamed the temple as Chongdemiao (崇德庙) in order to express the respect of Li Bing and his son. Chongde means the worship of virtue or reverence. During the Song Dynasty the temple was called Wangmiao (王庙) , which means the king’s temple. Down to the Qing Dynasty it was called Erwang Temple. People offered Li Bing and his son the posthumous title of Wang (king). The temple complex occupies an area of 10,072 square meters. the ancient timber buildings remain similar in design and style to other ancient Chinese architecture. The broad roof, perfect decoration, strict size and traditional use of color meet in harmony with the mountaintop environment. However, the temple buildings are not placed based on the concept of the north-south axis. The rear hall is devoted to Li Bing’s son. His son’s statue is newly molded. The figure stands firmly with a tool in his hands as if he was ready to level down mountains. Behind the statue is the Minjiang River, which serves as the background. Li Bing’s son had a name called Erlang (二郎). Erlang is a popular legendary figure in Chinese folk literature. In the folk stories, he has a close relationship with Li Bing. It should be pointed out that no recorded historical evidence could be found to show Erlang was Li Bing’s son. In Chinese feudal society, it would be a great problem if a family had no offspring. So in ancient times, local people regarded Erlang as Li Bing’s son. They sincerely wished that Li Bing would have a son so that Li’s family tree would continue. The main hall is devoted to Li Bing himself. The statue is newly molded. The old statue was a larger-than-life painted statue, and the figure looked like a wise scholar looking at the rushing river below. The newly molded figure has a silk map in his hand, and his eyes are bright with wisdom. It appears as if he is thinking about the blueprint of the project. According to Folk tale, July 24 of the Chinese Lunar Calendar is Li Ping’s birthday. On that day many local people visit the temple where they prostrate themselves before the image of Li Ping and his son and burn incense to honor them. At the same time, the beatings of drums and gongs resound to the sky as incense smoke curls upwards. Li Bing’s hall is a compound. The hall faces an opera stage across the courtyard below, surrounded by other buildings. On July 24 of the Chinese Lunar Calendar during the Ming and Qing dynasties local operas would be performed on the stage. Many people would gather in the courtyard and watch the performance. It is said that the actors offered the performance mainly for Li Bing as a tribute for his great contribution to local people. Anlan Suspension Bridge is one of the five ancient bridges in China. The total length is 320m. Its ancient name was called the Rope Suspension Bridge or the Bamboo and Cane Suspension Bridge. Unfortunately, a fire caused by war towards the end of the Ming dynasty destroyed the original bridge. In 1803, a new bridge was built. It was made with local bamboo rope chains, and the bridge bottom floor was replaced with wooden plates. The old bridge lasted until the 1970s when it was replaced by a steel chains bridge.